Most railway modellers are used to operating layouts either in parts of their homes; lofts, sheds, spare rooms etc, and in various exhibition halls, often the likes of school halls, gyms or village halls, but on the Saturday of the first May bank holiday in 2009 Fisherton Sarum was exhibited at a slightly more unusual location. 2009 marked the 150th Anniversary of the first passenger train that traveled from Salisbury to Gillingham. To mark this, a member of staff from South West Trains had organised an event on the station. A small number of layouts had been invited along to setup on Platform 4 of Salisbury station so pretty much the spiritual home of the layout. Setting up and operating on a station platform had some unusual challenges; the surface is not exactly the most level to start with. The layout was located under the station canopy, so rain, had there been any would not have been a problem, The glazing in the canopy meant the layout was very well lit, with the lighting rig hardly being required. 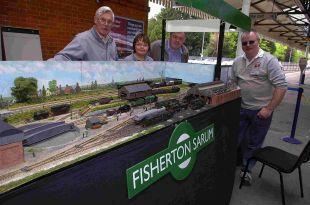 Wind is something not normally an issue when exhibiting Fisherton Sarum but here paperwork etc. would easily blow around the station if care was not taken. Noise was another issue, when a class 158 pulls into the platform a few feet away you realise just how loud these things actually are. Fortunately Fisherton Sarum has a system of indicator lights to communicate between the two fiddle yards, so this did not affect operation. 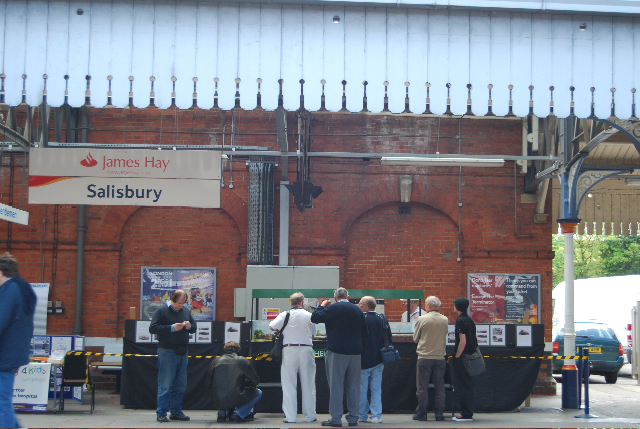 There was a mixed bag of visitors through the day; those that had made a special visit, railway staff past and present and bemused train passengers that arrived off the very frequent Saturday train service at Salisbury to be greeted by the sight of four model railway layouts on the platform. A reporter from the Salisbury Journal also attended and their report of the event can still be read online here.